In the era of converging technologies and boundary-less services paradigm, digitally enabled consumers are seeking to forever alter the way companies serve them. The YouTube, Facebook and Groupon generation of Digital consumers want more benefits, more easily, than they received in an analog world. Coupled with that crowd-sourced ideas and oddities, which are disrupting business paradigms more than ever. The enabled and connected consumers are able to introduce and experiment idea frameworks on a more cheaper and larger/global scale than ever before with the reach of Web technologies. The effects of digital disruption would start over-ruling industries in the immediate future perspective. Companies, both old economy and new economy are today wary of the digital disruption and are working at such on disruption readiness to counter their disruption vulnerability. An example to serve here is the case of HTML5 which is going to redefine internet and web experiences as never before. Who then are the losers? Microsoft, Apple and Adobe for example, each with an empire that has taken a decade or two to build but may see quick decimation thanks to the platform agnostic media programming and distribution paradigm that HTML5 advocates. Notwithstanding the disruption readiness that these majors are putting in place, HTML5 would still be instrumental in liberating the Web and eroding the high market share standings available with Microsoft, Apple and Adobe. Ready or not, the only solution available to companies will be to become a digital disruptor to their existing lines of business. By cannibalizing the present and future, will the present day businesses be able to invent the future. Planning for digital disruption is the new mode of doing business, which is constantly seeking the next adjacent possibility and working to quickly deliver product experiences that satisfy the digital consumers. According to a report released by Strategy Analytics, the Q3 2011 global tablet markets are now showing a shift from a Apple Monopoly to a Apple-Android Duopoly.Google’s Android-based tablets have gained market share in the iPad dominated tablet market during the third quarter of 2011. Samsung’s huge marketing effort behind its Galaxy tab series is finally beginning to pay off with Galaxy tablets currently accounting for 9% of the total tablet market. The global tablet markets grew by 280% y-o-y in Q3. Android steamed the growth by a 440% growth wheras iPad clocked 161% growth. Consequently the iPad which dominated smartphone shipments in Q3 2010 with 96% market share is now on 66% share of the market and Android has 27% of the market. There is reason to believe Android’s growth on tablets will continue to grow into 2012, as the introduction of Android 4.0 Ice Cream Sandwich could help tablet adoption among Android smartphone users.Amazon’s Kindle Fire will also drive Android tablet sales, estimating the company will sell more than 15 million units by 2013. 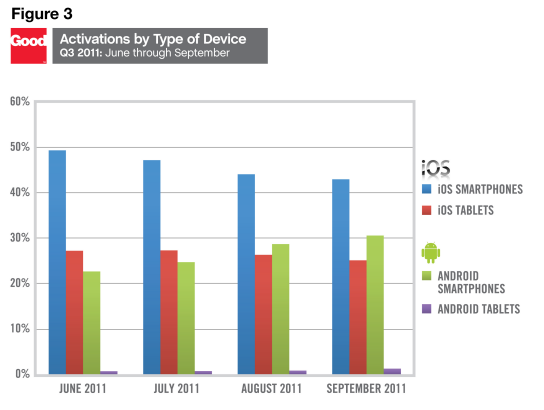 The catch in these statistics is that Android activations still lag iPad activations.The recently released Good Technology Device Activations Report for Q3 2011 shows that when it comes to tablets in business, enterprise users are clearly choosing iPad over the alternatives, noting “iOS tablets represent over 96 percent of total tablet activations”. Their graphic (below) also speaks volumes. Android tablet activations remain in the realm of a rounding error compared to what we’re seeing with the iPad and iPad2.However the good news from Android from the same reserach source, Good technology, is that Android activations “steadily grew” during the quarter landing at an average of 29.2 percent while total net iOS activations fell from 78.7 percent in Q2 to 70.8 percent. All this goes to say is that it is still early days for Tablets, Android and Apple (and possibly a missing Windows8). The markket is currently in the expanding mode and will continue to be so till 2015-16. Low cost constraint based innovation like the $35 Android tablet made by Datawind for India’s ministry of Human Resource Development will power penetration, reach and the mainstreaming of tablets as the next generationcomputing devices over the laptop (and possibly the smartphone). Ahead! Ahoy! for tablets it is then. As Nokia fights to regain its footing, the company recently abandoned Symbian and MeeGo to instead adopt Windows Phone in an effort to stabilize its declining smartphone business. But that move only addresses half of Nokia’s problem. A firm position in the big-margin smartphone market will be paramount to the vendor’s success moving forward, but the market for low-cost devices is still massive. Just as Nokia’s smartphone sales have spiraled downward in recent quarters, Nokia’s feature phone business been in sharp decline as well. Nokia took drastic measures in an effort to turn its smart device business around, and with the announcement of Meltemi, it appears as though the Finnish phone maker also has plans for its low-end phones. 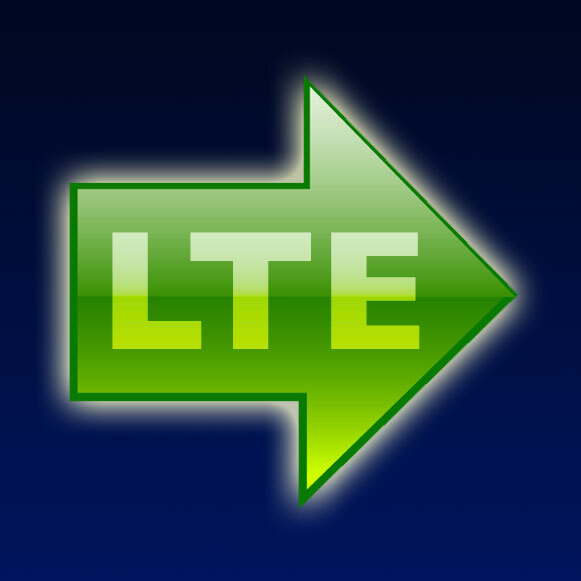 Towards the later purpose, Nokia is developing a Linux-based operating system code-named “Meltemi”. The Meltemi will allow the phone maker to offer devices with smart capabilities at rock bottom prices, extending well beyond the company’s potential reach with Windows Phone in emerging markets. 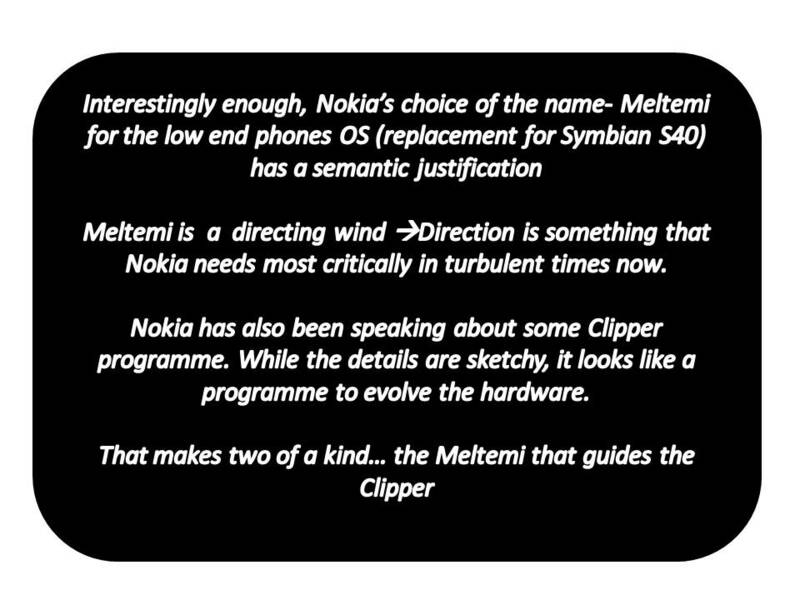 Meltemi will be the Linux based replacement for the Symbian S40 platform that has been workhorse at Nokia. Now with the UI and Apps taking the centre piece in Mobile OS, Symbian S40 wasnt cutting the ice. The choice of Linux is but obvious given that Linux with opensource code makes development easier and cheaper. Phones powered by Nokia’s Meltemi operating system will not be smartphones at all, and the standings of Windows Phone with Nokia doesn’t change a bit.The new platform is on the one hand very much aligned with Nokia’s mobile phone strategy stated earlier in the year (‘connecting one billion to the internet…’), but it’s also a competitive response to the newest trend seen in the gray handsets markets in the emerging world. China vendors are producing quasi-smartphones, another potentially unmet demand segment at significantly low prices based on the MTK chipsets. Meltemi will come into play, providing a smartphone lookalike that will essentially be a feature phone to address the demand for these phones in the emerging world and, Nokia hopes, preempt competition from the gray market vendors as well as their main nemesis in this segment – Samsung. Nokia-WP partnership and the upcoming Nokia-WP Mango smartphones have been hogging the limelight ever since the “burning platform” declaration by Stephen Elop. Windows Phone is only part of the puzzle Nokia is now in the process of piecing together, and its upcoming proprietary OS will play an equally important role in helping Nokia re-establish its position as a global leader.